This is a ‘live map’ so will change over time and in future months or years will look quite different. For now, it has a very hot “Bos-Wash to Midwest” but with everything from Wyoming west on the cold side (but with hot spots in the cities). These maps are all much larger than shown on the page. You ought to be able to click on them to get a very large version. The basic idea is to take the MIN-MAX average for the day, difference it from a base value for your crop, then sum up how many heat units you have as a running total. For each crop there is a total number that says “I’m Ripe Now” and you must reach that number before you run out of growing season. As the total racks up, it also lets you know how soon to schedule the harvesting crews. Not too surprisingly, various insects also develop based on ‘degree days’ and emerge as pests right on queue with plant growth stages. Different methods exist for calculating heat units depending on a) the crop or biological organism of interest and b) the whim or personal preference of the researcher. The calculation method most commonly used throughout the U.S. for determining heat unit accumulation relative to corn phenology is the formula first suggested by the National Oceanic and Atmospheric Administration in 1969 and labeled as the “‘Modified Growing Degree Day” formula in 1971. 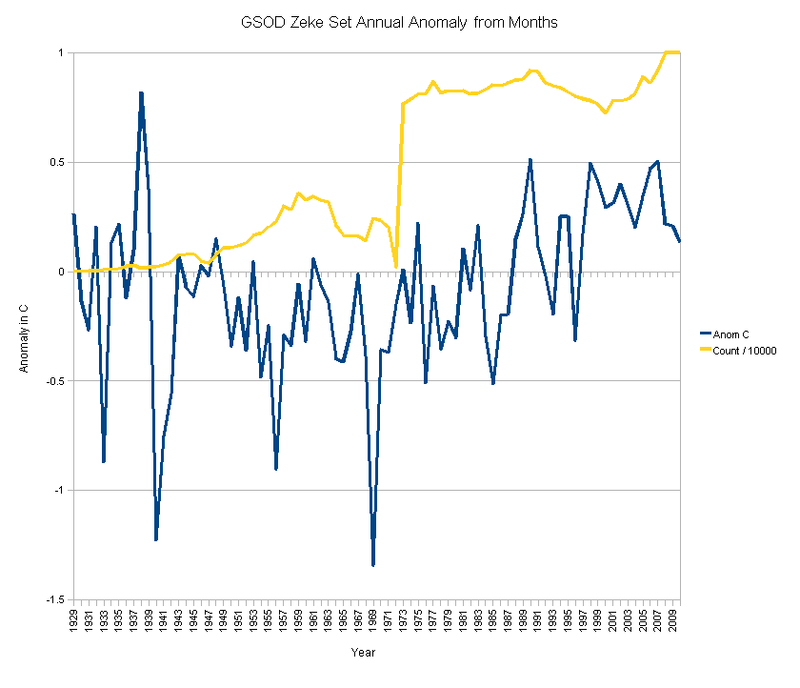 This method calculates daily accumulation of GDDs as the average daily temperature (degrees F) minus 50. The “modification” refers to the limits imposed on the daily maximum and minimum temperatures allowed in the calculation. Daily maximums greater than 86 degrees F are set equal to 86 in the calculation of the daily average temperature. Similarly, daily minimums less than 50 degrees F are set equal to 50 in the calculation. 10 °C is the most common base for GDD calculations, however, the optimal base is often determined experimentally based on the lifecycle of the plant or insect in question. Daily crop heat units are calculated from these min and max temperatures. There are separate calculations for day and night. The daytime relationship uses 10 °C (50 °F) as the base temperature and 30 °C (86 °F) as the optimum because warm-season crops do not develop when daytime temperatures fall below 10 °C and they develop fastest at about 30 °C. The nighttime relationship uses 4.4 °C (40 °F) as the base temperature and does not specify an optimum temperature because nighttime minimum temperatures very seldom exceed 25 °C in Ontario. The nighttime relationship is a straight line on the graph (Figure 1),while the daytime relationship is a curve that records greater crop heat units at 30 °C than at higher or lower temperatures. Daily crop heat units are calculated by using the average of the two daily values from the equations given in Figure 1 or they can be read from the matrix in Appendix I. So you can see that ‘degree days’ matter and that if you get it wrong you have Big Problems. Why Does It Matter To Non-Farmers? Because it is a very fine grained process and because it has to be right or folks don’t eat. None of this “Global Average” stuff and homogenizing the world either. It has to be accurate on YOUR FARM, not 3 counties over. None of this “3 thermometers on the SoCal Beach and one at S.F. Airport” like GHCN does for California either. You need to have lots of temperatures to make a fine grained product. The blue and red are ‘warmer’ and the green and tan are ‘cooler’. Uncolored is the same as the 30 year average. What I find interesting about this map is the way the warmth is concentrated on and around nearly point sources. That one inland and North East from Seattle is a real hot spot. Those sources look to be largely the urban growth areas (with, perhaps, some very localized UHI impacts on small rural locations). There is a general ‘warming’ in valleys, but the real ‘hot spots’ are in or very near the urban areas. Most of the ‘out back’ rural areas are neutral or cooler than average. So, to me, just looking at the Degree Day map explains a great deal about our “Global Warming”. We’ve moved the thermometers to where the people are located, down in the valleys, and put them at the airports where solar heating works really really well on black tarmac. But go ‘out in the country’ and it’s not so hot… and as in the case of Washington, it’s even below average and quite cold. For Washington we could clearly make either a warming or a cooling ‘trend’ by simply choosing where we put the thermometers. I’m presently wandering my way through other states. First stop after Washington was Oregon. This is a ‘live map’ so will change over time. But it’s the same pattern as Washington. Gee, it’s hot in Reno and Las Vegas and the L.A. Basin is warmer than inland. Wonder why that’s where NOAA / NCDC choose to measure the temperatures for GHCN? My final point here would be pretty simple: With the rather dramatic variation over very short geographical scales we would need far more than the slightly over 1000 thermometers used by GHCN to get any kind of accuracy in the global temperature picture. The GHCN data set is just not fine grained enough to avoid selection bias issues given the wide variation of temperatures on these graphs over very short geographic scales. Further, there is a clear tendency for urban and valley areas to be anomalously hot (such as in Washington and Oregon, though oddly in California the Central Valley is cooler than usual – I would guess due to the extra clouds we’ve been having).. IMHO, this warmth is most likely because that is where the people are, where they run heaters and air conditioners, and where there are millions of cars on black tarmac and tons of aviation fuel being burned for take-offs at all the airports. Given that, the placement of the majority of GHCN thermometers at airports and in or near urban and low elevation locations introduces a clear bias to the basic data used in all the climatology studies. Basically, we need a new data set and it needs to be a very fine grained one with full representation of the rural and high altitude areas. The present GHCN data set is polluted with selection bias that preferentially puts thermometers in lower elevations, near coastlines, and at airports in or near urban areas. 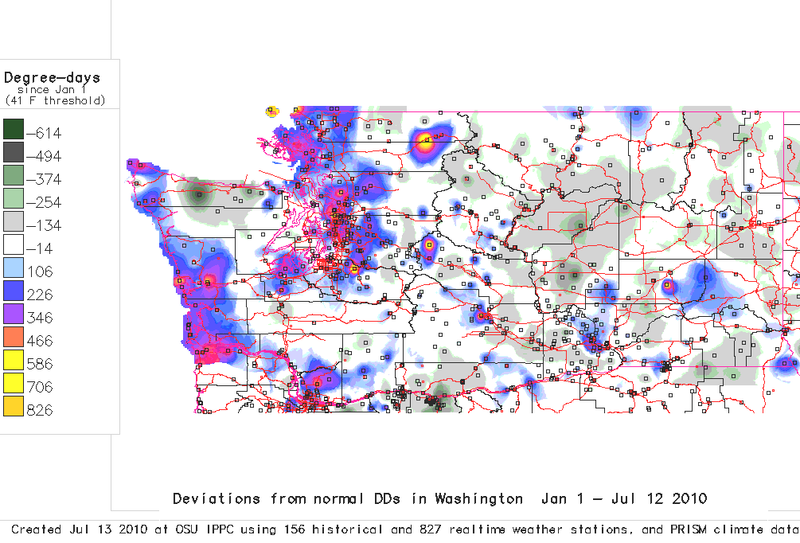 Exactly the kinds of places shown to have ‘abnormal warming’ in the above fine grained maps. This entry was posted in AGW Science and Background, Favorites and tagged Farming, Gardening, Global Warming. Bookmark the permalink. There are some good claret-like reds from the Gimblett Gravels in Hawkes Bay, a useful complement to the Pinot Noirs from Central Otago. Cheers! I toured North Island in the early 1980’s and loved it. At each town, I’d order a different wine. Usually whatever the waiter recommended as representative of local production or from somewhere near. Sometimes their favorite from anywhere in New Zealand. Never had a single bad wine. And when you make wines that remind me of them, well, that’s pretty good praise! So I’ll hunt up the Gimblett Gravels and the Otago Pinot, and many thanks for the suggestions! 12,000 temperature sources (ag site you reference) seems more than 1,000. 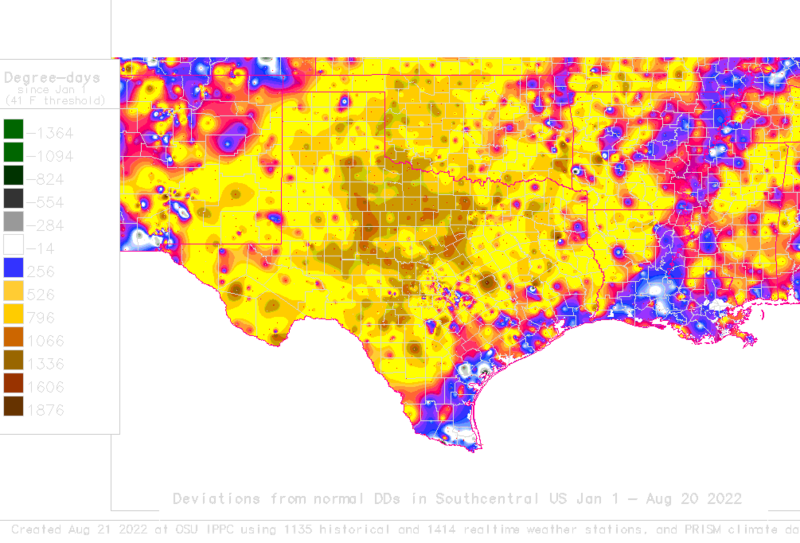 It might be interesting to see what color (degree-day) the GHCN 1,000 fall on. This wouldn’t catch micro-siting problems but it could point to more pervasive UHI influence than currently admitted. I wonder if the data generating the maps are available. 2) One more reason they don’t build airports on mountaintops except for in Nepal is thinner air, making the lift-off harder. 3) We don’t grow wine in the Alps, rather, in the Mosel, Rhine and Saar valleys where you have a warmer microclimate and suitable hillsides for wineyards. Great find! I’d just been trying to explain in blog comments here to one of the guys rewriting GISTemp in Python (Clear Climate Code) why I think the concept of global average temperature (or even anomaly) is a broken concept. I sure wish I’d had these maps to refer to a couple of hours ago. great idea – I reckon I can do that fairly easily – at least an approximation with an overlay map. 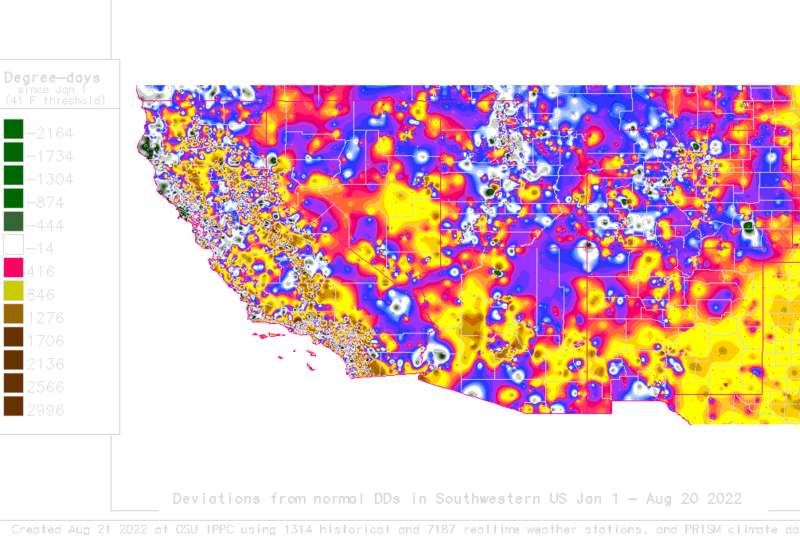 How about this: http://diggingintheclay.files.wordpress.com/2010/07/degree-days-map-with-climate-stations.png Feel free to use. I’ve ended up writing a posting around it as it fitted with the comments I had made earlier in the day. @E.M. I can do these for other states but need a jpeg or png I can capture. I did try making my own from the link you provided but it was taking me too long to figure out what I wanted the map to show. You are already familiar with it. We use a more complex version of degree days in the Victorian (Australia) natural gas industry. It incorporates further terms for wind speed, sunshine hours and time of year. These extra terms help to correlate the resultant value (we call them Effective Degree Days(EDD)) to natural gas demand. This measure has shown a decrease (warming) over the time it has been calculated since 1970. At least part of that warming has been confirmed by the BOM as due to UHI effect as the measure uses the single temperature record from the Melbourne Met Office. It is not designed or useable for climate studies but represents another use of the concept. Wonderful, additional , scientific, evidence to contribute to the argument that the IPCC evidence is flawed. I know a young lass, 50 or so, who lives here in Arizona in Apache Junction. She was a friend of my daughters lo, those many years ago, and she grows a lovely and large vegetable garden . . . througout the vicious hot summers. A year ago (rarely see her) she stopped by to chat a bit, delivering to me a lovely bunch of garden produce. Having done a good bit of gardening myself when I lived in SoCal, I asked her how she grew such fine vegetables summer long, with temperatures typically over 100 degrees F, highs frequently well above 110 degrees F, and cloudless skies. Thermometers take only the temperature of themselves, and temperatures are highly variable depending on location, here in Phoenix differences of 12 degrees over relatively short distances are not unusual. At commercial and USAF bases, beginning about 1950 or so, for USAF, and in the mid to late 1960s for commercial, piston engine craft were replaced with large essentially blow-torch jet engine aircraft, and more and more of them as time went on. Of course a significant warming of air wouldn’t occur with blow-torches operating all over the place, and more and more frequent flights as time went on. I was in the USAF 1954-1958. SAC HQ. I could stand directly behind a heavy bomber with piston power and the engines running. Vertical stripes were painted on the body in line with the propellers, so personnel wouldn’t walk into the propellers when when engines were running. Got really windy and noisy when the engines were powered up. On AC carriers, there are large blast shields for personnel to get behind, relatively close quarter operations. Don’t want to be anywhere behind the tail for at least a couple of hundred feet with any jet engine powered up. Not a matter of rocket science. Jet engines put out much greater volunes of exhaust at much higher temperatures than piston powered craft. @Vertity Jones: Let me know what states or regions you would like. Could that be done on the “California and Southwest’ regional graph above? I always found ‘local’ wines were far better than the ‘imports’ from overseas. Think it has something to do with handling, locale, (and price;-). As a rule, I’ve found House Wines (outside the US) generally are far better than “Name Brands”. Can’t wait for some of that world famous Scotish wine to get on the market again, been told the really good stuff won’t be around for another hundred years; something to do with weather. Many wines are sensitive to vibration and the potential heat cycling (cold and hot) from transport. Rarely does a shipper hold the cargo at cellar temperatures and assure no daily cycling… Knowing this, the most precious wines are not shipped very far and are only shipped with great reluctance, with special care, and at significant costs. Exotic bottles and those used in wine tastings of great note may be personally carried to assure their history. The mediocre stuff will be shipped via low cost bulk shippers. For bulk wines, most folks won’t notice. For stellar wines, it can change the more subtle flavors. For very old wines, it can stir up sediments and cause cloudiness. So first off, a major wine buyer would have to KNOW about it, and they won’t. I’m a ‘nobody’ on their radar. But even worse, the buyer for, oh, Safeway Grocers or even a place like Red Lobster is going to need 2,000 to 20,000 cases to even think about putting it in their stores. And a place like Beverages and More can be even worse. Now take those places and roll a dozen of them together and have them all talking to the same wine merchant / importer… Those 200 cases of Chateau eSmith are not even going to be mentioned. The buyer is only visiting places that can supply 100,000 case lots. So you might get a boutique buyer who would notice, and put it in private stock. Selling a bit to local high end buyers or restaurants with a flare for the novel. But most likely the only folks who will know are the vintner and his direct contacts. Perhaps a local restaurant or two that can use 20 cases each selling a single bottle or two per night for a year. I learned about this issue by talking with a local vintner and then asking the local wine merchant the same question. Both said the same thing. Large buyers want large volume and consistent quality before they take on the expense of stocking a ‘line’. The best stuff is small batches and is by definition a result of an inconsistency (to the good side!). The two never match up. Thus the ‘special vintage’ and ‘proprietors reserve’ and all the wine snobbery of knowing some particular odd little winery. So the local guy has a local distributor (or maybe just sells from the winery himself) and it never goes far from home. Oddly, this is the exact opposite of most bulk commodities. For things as diverse as Oranges and Lobster, the best quality is typically found the furthest from the point of origin. Why? If I’m going to air ship a lobster from Main to London, I need a high price to cover the shipping costs. If I’m going to stock Oranges in December in London, they will be pricey and only the best ones will get folks to put up the money to buy them. Those two things collide to say that the further the product is shipped (when shipping is a significant part of the cost structure as in bulk goods) only the higher grades can fetch enough price to cover the shipping (or will fetch enough more to make maximal profit). Conversely, that ‘slightly blemished’ orange or the ‘too small lobster’ will not ‘pay the freight’, so gets sold locally. Never really had a use for it professionally, but at least it let me know why I got great lobster but ‘the usual pretty good wines’ on the wine list when traveling. But near here got great odd little wines at local ‘dives’… And I went out of my way to have ‘the local stuff’ at restaurants all over down under… The best Australian and New Zealand wines don’t get shipped far. You must go to them. I learned this once when traveling with an English friend. She had the typical accent of a college professor class. And that impresses folks (for reasons I don’t understand…) even in wine country. We were ‘on a date’ so had both dressed up somewhat formally. And I was taking wine classes so… We each had a little notebook. Nothing much, just wanted to keep track of things by the end of the day… Also, at each stop, I asked for “a glass of water to cleanse the pallet”. We do taste, in proper order, the wines and then make discrete notes in the notebooks. Sip the water, then on to the next wine… We were also doing this on a modestly slow day (not the usually tourist time, mid-week working hours). Sometimes they opened a new bottle (often with a special label on it) and sometimes it was already open, but in a special place. In all cases, once they knew YOU cared enough to ‘do it right’ and were serious about what you were learning about their product, then they wanted to show off the ‘good stuff”. We didn’t set out to do that, it just happened. But after 2 or 3 wineries, we caught on. I have to admit, we had great fun the rest of the day ‘pretending’ to be writing an article on wines of Napa for an English publication. (And to this day I’m favorably disposed to those wineries that we visited, so they got about 30+ years of ‘good will’ out of the deal. Robert Mondavi was one (though it was only about 12 years? old then and ‘new’). Beaulieu Vineyards another. Christian Brothers. Sebastiani. We hit most of the ‘big names’ of Napa Valley. Hey, E.M., did you ever find a way to stop the AGW/Scorched Earth prevaricators! Plants/crops do not lie and everyone likes to eat. Will the pseudo-scientists give up those corrupting anti-science-government grants if they can’t find any food on which to spend their ill-gotten-gains? My tomato plants in the close-to-coast L.A. area have produced, but the fruits are tasteless mush due to almost constant overcast. I’m pulling them out and putting in new ones today — with 2- and 3-year old grandchildren’s help. Maybe the sun will smile on us during the late summer and fall. In the 80s yesterday. I would caution against drawing any conclusion in regards to Washington State except that anyone who believes a thermometer can be representative of anything except where it is exactly located needs mental health care. Port Angeles, Washington..despite it’s Northern Location in Washington State is locally referred to as ‘The Banana Belt’. It’s a naturally occurring hotspot with Palm Trees and such. Rosyln, Washington where the TV series Northern Exposure(fictionally located in Alaska) was filmed is within 10 miles of a retirement community called SunCadia, which has one of the highest sunshine indexes in the entire state and could easily pass for a retirement community in Southern California. Despite being only a few miles apart the ‘climates’ are dramatically different. 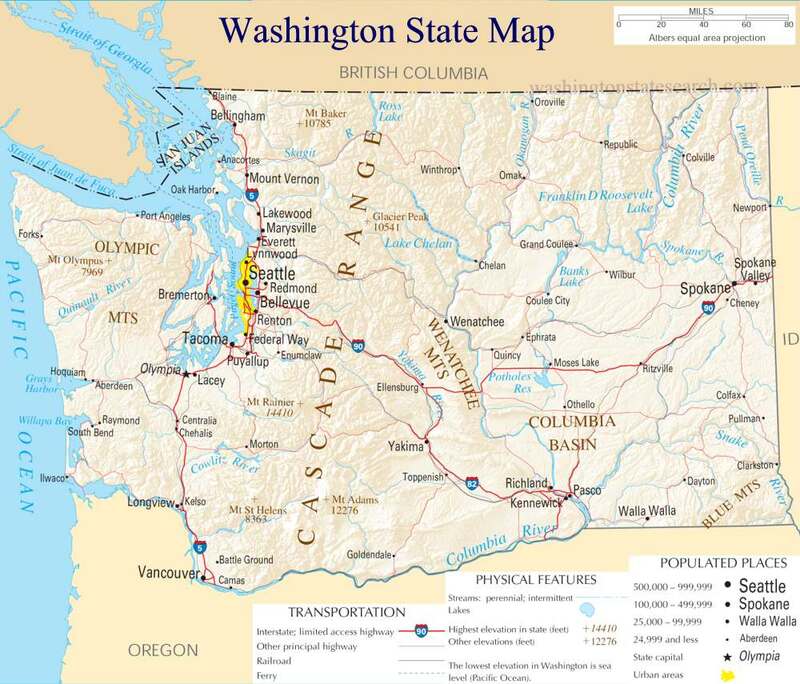 The bright yellow hot spot northeast of Seattle is in a bowl, surrounded by mountains on three sides with a clear southern exposure. What follows may be self-evident, but….. The guys who’ve been doing reconstructions published at Lucia’s, WUWT, and AirVent seem to come up with quite similar results in terms of “global” temperature trends despite using different calculations and self-written programs. And quite similar to GISTEMP at that. They are each using the same GHCN temperature time-series, the “unadjusted” ones. When it was suggested that the convergent results are not at all surprising given identical data input, Zeke Hausfather remarked that he’d tried a run with the much larger GSOD dataset and found those results similar. Suppose, for the moment, that all temperature time series might produce similar trends in the GISTEMP-like reconstructions. For starters, one might recognjize that all temperature time-series suffer from the same selection bias. The thermometers must be located where they can be read every day. These locations can not be spatially or environmentally random or gridded since the reading of the thermometer can never be the sole occupation of the reader. Given that the readers livelihood must be supported by other activities, the thermometers must therefore be located for the convenience of the reader rather than in places likely to produce the most reliable appraisals of the temperatures (and anomalies) of our evolving climate. My suspicion is that the reconstructions will produce “similar” trends no matter which data-sets are used unless someone comes up with a filter to remove locational convenience. Maybe that’s not so hard. Interesting procedure, because the difference between max and minimum seems more meaningful. And if humidity is considered then is better. It is quite different to have a nice temperature of, say, 15 degrees celsius, but if you have more than 88% humidity, the heat loss is bigger, it’s like being in a bathtub filled with water!, and also farmers could have the correct temperature but with enough humidity for fungi to reproduce it would kill crops too. So to have an economic predictive tool humidity is to be considered also. You can also get daily means through the script on the site, but its a tad large for practical use unless you have a beast of a machine. @Pyromancer76: Well, we taught our kids “baby sign’ as both my spouse and I have some hearing loss (we met in a sign language class…) As a result, the kids were communicating with use at about 5 or 6 months old. Large vocabulary of spoken words by age 2. Never had ‘terrible twos’ as they never had the frustration of non-communication. It’s a bit bizarre to go into a ‘few months old’ kids room, look into the crib, and have them sign “change me and get some food!”… but it really does help. On Tomatoes: I’ve just started getting a few (4 so far…) including a couple of ‘Roma’. I’m in a marginal area anyway, and this year is very cold. FWIW, planting a “Siberia” or “Siberian” as a pollinator helps the warmer vines. I think “San Francisco Fog” might also work. Their pollen will grow at temps in the 40 F range, so sets fruit below 50 F night temps. I’ve also gotten fruit from nearby ‘warm types’ from, I think, cross pollination. The hot east coast has been pushing up natural gas prices (as it is used for peak electric generation for the AC demand). We’re in the summer Nat Gas peak time. That’s why I’ve been advocating nat gas rich oil and gas trusts for a while. It’s that whole “Hurricanes and AC” summer trade. @adolfo Giurfa: For growth prediction, degree days is fine as it stands. But as you pointed out, for integrated pest management, humidity comes into it big time. In my home town we would sometimes get rain during one week in August. Right when peaches were ripening. Depending on how ripe, how humid, and how quick the sun came back out to dry things off: the farmer would have to decide to dust with sulpher or not. A several thousands of dollars decision… Done by rule of thumb in the old days, by formula now. @E.M. we also taught our daughter baby sign beacuse I’d read about the benefits, but we never got that far with it, because first words came at 8 months and understandable key words a few months later. I have a wonderful moment captured on video on her first birthday of her reaction when I realised this word she was trying “doof” was “juice”. By two she could hold quite a complex conversation, sign language was forgotten because it just wasn’t needed and no, we didn’t have the ‘terrible twos’ either. Re that lovely temperature drop in the adobe-built missions – I assume they are painted white? That would have a big effect – blog post on this in preparation. By two we were rarely signing either. Used about a dozen signs mostly, then the words started. I’m pretty sure it dramatically jumps starts ALL language skills. We had “I drew a happy face in the condensation from the humidifier!” at something like 3 or so (as kid was standing in his crib to reach the window…) My wife (who teaches special ed and knows the development schedule for all types) was floored as it was several years ahead of what is ‘normal’. IIRC, the expected state was fragments of sentence with up to 3 words of 1 or 2 syllables each. A bit less than year old daughter in 1978 had 9 words – yes we counted. da,ma, hot, guk (milk), ball, ka (cat) I can remember. Outdoors, she would point at something and say word which is how we discovered that Ka was any four legged animal, Hot meant dangerous, and Ball meant spherical – possibly also round. it appears that she had a good grasp of the concepts and was trying to fit the nomenclature to what she already understood. Pinker (which I bought) so suggests. She went from 9 words to 25 or so in a few weeks, then 40 and then more than we cold count. It was fast. I wish we’d kept better records. I suspect there was no verb in the first 9 but am not sure. Now she has Spanish, Portugese, Thai, Burmese, one of the Shans and English. btw E.M., what I thought was a perfectly moderate observation is stuck in your queue, I think for the misdemeanor of naming those who should not be named. Or maybe it actually was dumb – anosognosia, again. Thinking about Degree Days as a metric then would it not be sensible to use THIS temperature ayalysis as the calibration base for any plant based proxy? That is, any plant based proxy temperature data should be using this as its temperature calibration standard (after all that is what it is being used for here in agriculture). The actual (mercury) thermometer record may then be reasonably aligned with this, assuming some baseline or other matching function can be created. This has probably been done somewhere by someone already. Does anyone know if it has? @harry: The bright yellow hot spot northeast of Seattle is in a bowl, surrounded by mountains on three sides with a clear southern exposure. The more I read, the more I see evidence that Hansen’s 1200km extrapolation between stations is a load of crap. Willis Eschenbach tore this idea apart a while back (that temp trends up to this distance are well correlated) – and I continue to see examples disproving it. Harry’s post is a great example; also just the other day on WUWT they discussed the record high in arizona (at an airport, of course) and just 5 miles away a temperature 5* F cooler was recorded, away from the asphalt, etc. @J Ferguson: I noticed something similar. The kid gets a concept and attaches a word, then slowly narrows the scope over time as new words are added. Per “stickage”, wordpress has a variety of things it decides ought to be ‘held’ and then the blog owner can add a few too. I can’t always tell what caused ‘stickage’, but I don’t have that many personal rules. Mostly just “new folks” and anyone who’s been impolite goes to the review-queue. No special filter on anything you do, so I can’t see what caused it. For some reason, wordpress will sometime toss what looks like random folks into various queues, then change it’s mind later. I’ve had at least 2 folks that I’ve marked as generally approved who’ve suddenly and inexplicably gone to the spam queue, then sometimes go back to normal. @MichaelM: Yeah, and then realize that they don’t just do the reference station ONCE. They apply it serially. To the best of my knowledge, there is no paper to justify that behaviour. One of the first things that made me go: What The F…? IMHO, it was a paper based on some slight of hand cherry pick that justified the method, then they went nuts with over applying it. Perhaps not an ideal spot to throw this item in, But, do you have any comments about this posting? Tomgram: Ellen Cantarow, Blowback Crude. Is this just a glitch, suspect propaganda or have some significance? Interesting story from Blenheim, NZ, about red wines and temperature. I was helping with an ERP install at Dominion Salt, just down the road, in 1998 – a big salt year (sea salt – a Lot of wind, temperature needed to evaporate it), a great year for red wines, and of course almost as hot as 1934, according to my mum-in-law who experienced ’34 as a teenager. Bought a few bottles of Seresin Sangiovese ’98, liked it, bought some more. Next couple years rolls around, and back in Blenheim for a jaunt. Inquire at Seresin about some more Sangiovese. Sorry, sir, ’98 was the last year. For the two following seasons, the grapes would not ripen sufficiently to make wine. So we pulled the vines out…. My take on it is pretty simple. I call it the “Lava Lamp World”. When we move to a ‘dumping heat’ regime (NOT temperature…) we’ve got a very large ocean full of heat. Most of the heat leaves from the poles (less sun in, less O3 blocking IR). It has to get from the equatorial oceans to the poles to be dumped. So we get large blobs of ‘tropical temperature” flowing north over some places (like the East Coast due to being just above the Gulf of Mexico) and large blobs of cold flowing south (over places like California and the Pacific Northwest as we are just under all that Alaska / Canadian cold area a bit ‘up jet stream’ from us). So all the folks going bonkers about the heat on the east coast have it entirely wrong. It’s the temperature on the east coast that is of interest, and what it says is that the HEAT is leaving the planet (and the cold air return flow in California is the confirmation that the heat was dumped). But if you average those two TEMPERATURES together (the hot East and the cold West) it means NOTHING, as temperature is an intensive variable. But if you figured in the mass flow, the phase changes of water, all the specific heats of soils and objects, you would find a net heat loss (as the satellites have found). It is that fundamental error of confusing temperature with heat and compounding it with the error of doing averages on an intensive variable that make the whole “climate science” approach flat out broken and a complete mathematical fantasy. Unfortunately, it is far more easy to understand “It’s hot in D.C.!! PANIC!! !” than it is to understand intensive variables, specific heats, phase change, heat vs temperature, and both derivatives and integrals. On the other hand, the use of temperatures as a scare tactic shows it is a political movement rather than one looking for a physical and mathematical truth. EM, I think your ‘Lava Lamp World’ comment is one of the best, most succinct ways of explaining the heat versus temperature distinction, that I’ve come across. Deserves its own item, really. I know you’ve done the ‘Integrating’ post, but that flipped the Stats Horror Switch in my poor brain, and apart from taking the point that weather is fractal, I’m no wiser. So, Lava Lamp…..expanded? The biggest issues I see are that the data start way too late to be very useful (in 1929 with 13, and it doesn’t reach 1000 until 1949 ) and then peaks at a tiny over 10,000 in 2008-10. This means there will a huge load of splice artifacts in it. Mostly you will be seeing ‘trends’ that come from gluing thousands of different thermometers together, with not much actual trend from any real thermometer, along with the signal form the 60ish year PDO cycle et. al. Still, the graph does show it was warmer in the recent past than now (1939 ish) and it shows us in 2009 as being about 2/10 C above zero or effectively “lost in the noise” and that’s not accounting for UHI impacts. So, thanks for the data, but it needs to be about 2 x longer and have much less change of instruments over time (stable instruments over about 5x as much duration) to be really usable, IMHO. Still, it’s nice to have a picture of “nothing happening” other than the very cold mid-1970s when it snowed in places that don’t normally get snow and the world was having a New Ice Age scare. Will the pseudo-scientists give up those corrupting anti-science-government grants…? Grants for Global Warming will drastically stop after Cap&Trade is approved.